MegaNatural®-BP is a patented grape seed extract shown to maintain blood pressure in human clinical trials conducted at the University of California at Davis Medical School. The product is made in California from a special seed blend entirely from unfermented red and varietal white wine grape seeds. The Polyphenols are extracted from grape seeds using hot water. The extract is then purified, concentrated and spray-dried into powder. What does rust have to do with your health? More than you might think. When iron is exposed to air, oxygen triggers a chemical reaction called oxidation. During oxidation, renegade oxygen molecules called free radicals chip away at the composition of the iron. In our bodies, similar free radicals form as byproducts from the “burning” of food for energy and the breakdown of toxic substances, such as cigarette smoke and other pollutants. Free radicals are also called “oxidants” because they oxidize, or damage, the body’s cells. Over time, increasing numbers of free radicals oxidize various cell parts, including membranes, proteins and DNA. The damage to DNA is particularly serious because it alters our genetic code, making it less efficient, accelerating the aging process and increasing our risk for degenerative diseases. Antioxidants neutralize, free radicals. MegaNatural®-BP is extracted from grapes using hot water. It has received GRAS status from the FDA, meaning the FDA considers it safe. Should I consult a physician if I have concerns about my blood pressure? Yes, always consult a physician before adding or changing your existing blood pressure management program. Click here to download a information packet that you can take to your doctor. Are there any interactions with MegaNatural® BP? There are no known interactions with MegaNatural®-BP, but check with your physician first. On average, products containing MegaNatural®-BP cost less than $0.50 per day. Click here for a list of products that contain MegaNatural®-BP. Antioxidants are compounds that have the capacity to neutralize reactive oxygen species. Oxygen free radicals generated by oxidative and other biochemical pathways are the main cause for a number of degenerative diseases. Antioxidants act as radical scavengers, and convert the radicals to less reactive species. The imblanace due to the presence of excess free radicals and lower antioxidants causes oxidative stress and many chronic health problems such as cancer, atherosclerosis, myocardial infraction, senile cataracts, and rheumatoid arthritis. Polyphenols are the most abundant group of plant phenolic compounds, known to provide much of the flavor, color, and taste to fruits, vegetables, seeds, and other parts of the plants. As dietary sources of biologically active compounds they prove to be valuable for health. They have been linked to reduce the risk of cariovascular disease, cancer, and other degenerative diseases. Commercially available grape seed and skin extracts are a rich source of these polyphenols. The various health benefits of polyphenols have been associated with their antioxidant, antibacterial, anti-inflammatory, and anti-allergenic properties. Where do the grape seeds and grape skins come from? Polyphenolics uses only non-fermented seeds and skins from California wine grapes and juice grapes collected in the Central Valley of California. Constellation Brands, Polyphenolics parent company, is the largest wine company in the world so we have a large supply of raw material to choose from. What varieties of seeds do you use? Polyphenolics uses a special blend of seeds from red and white Vitis vinifera grapes. Is the grape seed extract made from seeds and skins (pomace) or seeds only? MegaNatural® Gold grape seed extract is produced from grape seeds only. The seeds are separated from the skins and stems prior to extraction. Other Polyphenolics products are made from both seeds and skins, which is also known as pomace. How are the seeds stored prior to extraction? After the seeds are separated from the skins and stems, they are dried to less than 8% moisture and stored in a cool, dry location until processed. What is ORAC and how is it done? Trolox (water-soluble analog of vitamin E) is used as a standard. This method is more common in the U.S. than in Europe and more customers are requesting this data. We had samples analyzed for ORAC values by Brunswick Laboratories (Wareham, MA). They have a fairly detailed web site that explains ORAC as well. What do health care professionals have to say about MegaNatural® BP? What are tannins and how do they relate to flavan-3-ols? Tannins are plant polyphenolics that possess the property of precipitating proteins from aqueous media. Tannins can be separated the tannins into two classes: hydrolyzable tannins and nonhydrolyzable or condensed tannins. According to Haslam, a world-renowned phenolic chemist, the term proanthocyanidins means the condensed or nonhyrolyzable tannins. Chemically speaking, the terms condensed tannin and proanthocyanidin can be used interchangeably and both are comprised of two or more flavan-3-ol units, but proanthocyanidin seems to be preferred in the nutraceutical industry. Species in the Vitis genus (i.e. grapes) contain non-hydrolyzable tannin; or complex polyphenols which can not be degraded under hydrolytic conditions – either acid, alkaline or hydrolytic enzymes – into simpler fragments, mainly sugars and some phenolic acids. Billot, J., Fleuriet, A., Macheix, J-J. 1990. Fruit Phenolics. CRC Press, Inc. Boca Raton, FL. Haslam, E. 1979. Vegetable tannins. In “Recent Advances in Phytochemistry”, Vol. 12, Swain, T., Harborne, J.B., and Van Sumere, C.F. Eds. Plenum Press, New York, 475. What is the definition of OPC (oligomeric proanthocyanidin)? Proanthocyanidins come in a multitude of chemical structures and sizes consisting of base units called “monomers”. Proanthocyanidins containing two or more monomers chemically linked together are called oligomeric proanthocyanidins or “OPCs”. OPCs containing two monomers are called dimers, three monomers are called trimers, four are called tetramers, five pentamers, etc. After considerable discussion, it was the consensus of the Grape Seed Method Evaluation Committee (through the National Nutritional Foods Association) to define OPCs as all proanthocyanidins containing two or more monomers, including polymers and condensed tannins. Yes. There are two MegaNatural®-BP patents. The first patent was issued in 2003 and covers the unique manufacturing extraction process, giving it a much lower average molecular weight than any other grape seed extract on the market, increasing its heart-healthy benefits. The second patent was issued in 2009 for the method of lowering blood pressure in pre-hypertensive individuals with metabolic syndrom using MegaNatural®-BP. What solvents do you use in your extraction process? Hot water is the only extraction solvent used. Do you use sulfur dioxide during the processing of your grape skin extracts? Unlike enocianina grape skin extracts from Europe, Polyphenolics does not add sulfur dioxide during the extraction of our grape skins. Therefore, Polyphenolics’ GSKE and GSKE-40 skin extracts contain less than 100 ppm and 75 ppm of sulfur dioxide, respectively, while competitors’ extracts may contain up to 5500 ppm of sulfur dioxide. Have you analyzed your product for ORAC? Yes, periodically we send our extracts to be analyzed at Brunswick Labs (Wareham, MA). 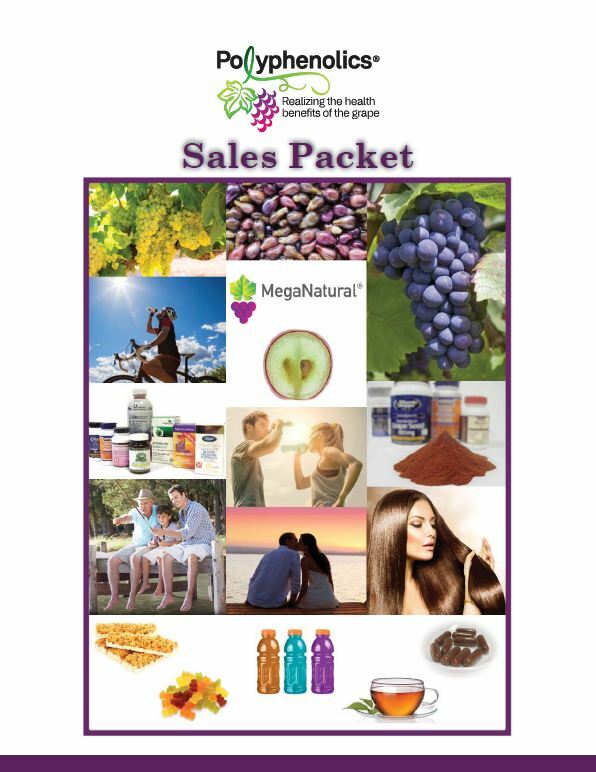 See all of the products containing MegaNatural® grape seed extracts and who sell them. We have prepared this document that contains some useful information for your physician's review before adding MegaNatural®-BP to a nutrition and lifestyle program for your optimum cardiovascular health and well being. *These claims have not been evaluated by the Food and Drug Administration.